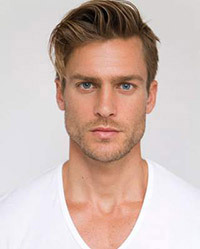 Jason Morgan was born in Glen Mills, Philadelphia, United States, on March 7, 1986, is an American male model. Morgan was discovered when his buddy take polaroids of him and send to modeling agency Ford Models. He began his modeling career at the age of 22. Jason's hobbies are watching sports and movies, reading, yoga, cycling, boxing and running. Vogue Hommes Japan, Esquire Philippines, The Financial Times-How To Spend It, Manifesto, Vogue Mexico, MFF Magazine, Schön, DSECTION, Vogue Paris, Vogue Russia, Carbon Copy, Sportswear International Cover, Hercules, Men's Health U.S. Cover, GQ Portugal Cover, Glamour Spain, DA MAN Style, L'Officiel Hommes Paris, Elle Czech Republic Cover, Elle Romania Cover, Elle Man Vietnam Cover, L'Officiel Hommes Hellas Cover, August Man Malaysia, Vanity Fair Italia, Reflex Homme Cover, Glamour Italia, Maxim, Horse Magazine, Men's Health Germany Cover. Perry Ellis, MAC, Porsche Design, Brooks Brothers, Hugo Boss, Givenchy, Salvatore Ferragamo, Philipp Plein, Dior Homme, Giorgio Armani, Emporio Armani, Aigner. Walked runway for Todd Snyder, Cadet, Carlos Campos, Perry Ellis, Philipp Plein, Dolce & Gabbana, Nautica, Joseph Abboud, Giorgio Armani, Brioni, Canali, Versace, Ermenegildo Zegna, Emporio Armani, Fendi, Daks, Louis Vuitton, Gieves & Hawkes, Balmain, Acne Studios, Givenchy, Carven, Dsquared2, Gucci. Represented by agencies New York DNA Models, Paris Premium Models, Cape Town Ice Models, Milan d'management group, Elite London. Hockey was a big part of my life growing up. It taught me discipline and how to be goal oriented. I really enjoyed my days working with Ralph Lauren. I love everyone who works there. It’s always a great time and always in an amazing location in a first class hotel. Modeling like anything else is something you get better at with time and practice. I have seen places in the world I probably would never have got to see if I wasn't in this business. My favorite model is Cindy Crawford. I had posters of her on my wall as a kid and I still think she is gorgeous. I really don’t think there are any hidden secrets for living a healthy lifestyle. We all know that exercise and eating healthy, natural foods and drinking a lot of water are the most important things to do to stay healthy. It’s just a matter of making it a priority and a habit.